The theme of the 2018 ASA-CSSA-SSSA international annual meeting was the power of human interaction combined with science to create solutions. 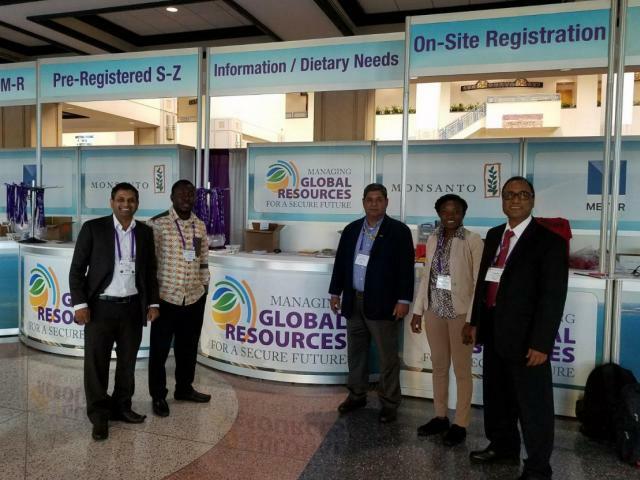 The meetings were held in Tampa, Florida on October 22-25, 2017. With more than 6,000 attendees from over 55 countries and 3,000 technical programs, it was a unique conference that brought together global scientific leaders from industry, government agencies, and academic institutions in one platform. The OSU South Centers team delivered twelve presentations in different program areas and moderated one technical session. The team included authors and co-authors from six different countries, namely Burkina Faso, Ghana, India, Ukraine, USA, and Uzbekistan. Our USDA-FAS Borlaug fellow Dr. Alima Bandaogo delivered a presentation entitled Optimizing use of fertilizer for tropical food legumes both in sole as well as intercropping from West Africa. Emmanuel Amoakwah, USDA-FAS Borlaug LEAP PhD scholar, presented two posters; first representing the Biochar effects on microbial community profiling using phospholipid fatty acids (PLFA) analysis, and second showing the Effects of biochar on soil aggregate stability and aggregate associated carbon and nitrogen content on tropical soil from Ghana. Alan Sundermeier from OSU-Extension Wood County as one of the co-authors presented the Impact of organic grain cropping systems on soil health parameters. The research was funded by the USDA-Organic Transition Program and conducted simultaneously at both Bowling Green and Piketon sites for four years. Vinayak Shedekar delivered three oral presentations and one poster; first showing Uncertainty in rainfall measurements and its implications to hydrologic modeling; second on Healthy soils - Healthy Environment; third on Research available to build healthy soils, and fourth A new method to measure particulate organic carbon, nitrogen, phosphorus, sulfur pools as an early indicator of soil quality. He also served as one of the judges to evaluate graduate students’ poster competition. Yogendra (Yogi) Raut had three presentations, two oral, and a poster. The oral presentation showed the results about Soil quality assessment using long-term Conservation Reserve Program (CRP) land as a guide for policy makers and the poster was titled A Simplified approach to greenhouse gas emission modeling. Yogi delivered another oral presentation entitled Aggregate associated carbon and nitrogen pools in response to different tillage systems. Rafiq Islam moderated a technical session on soil health analysis, interpretation, and recommendations under the Soil and Water Conservation theme. He also delivered two oral presentations; Long-term tillage effects on soil health and Soil health analysis, interpretation, and recommendations.